58078 • Tamiya Fire Dragon • (Radio Controlled Model Archive) • RCScrapyard. 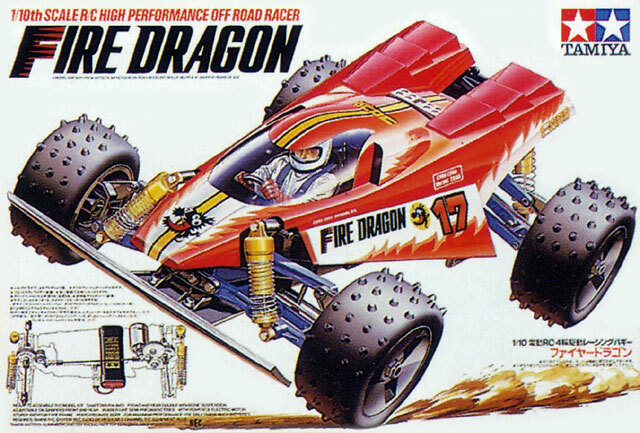 Released by Tamiya on April 27, 1989, based on the Thunder Shot Chassis, the Fire Dragon was easier to build than most other cars that were around at the time, which made it ideal for the beginner. It was easy to drive and handling held few surprises. Negatively, the C-spacer clips that were used to stiffen the springs, would often simply fall off during races, particularly on the fast tarmac circuits, this was easily remedied though with a strip of plastic sticky tape. Speed wise the car accelerated well, but had a limited top-end speed with the basic 540 motor provided in the kit. The car could be easily be modified as the drivers experience grew and many racers did use "hop-ups" to prevent being bored with the predictability of the machine. These additions improved and individualised the cars, allowing improving drivers to advance to the next level. The kit comes with Nylon/plastic and sintered brass bush type bearings, that after a short while actually wear into the metal cup drive shafts. If you are building this kit to race seriously these should be replaced by a full set of steel shielded ball bearings. Always a collector's favourite, the Fire Dragon was re-released in 2008 (#58403). 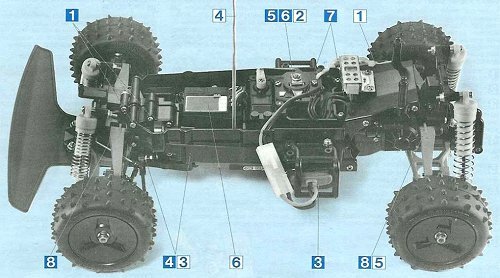 Buying a used Tamiya Fire Dragon Electric Buggy, or any used RC Model, has a number of advantages. It is generally cheaper than new, ready built and may come with a variety of expensive hop-ups already installed. Cheap, pre-loved bargains are always becoming available. However, depending on the age of your purchase, it may need a little tender loving care before you can take it out on the back yard. If the body shell of your Tamiya Fire Dragon is broken, ripped or damaged in any way, this can be easily repaired with rubber solution glue. 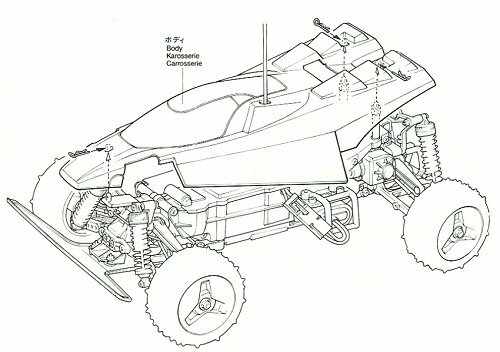 Also, for added protection and if available for your Fire Dragon model, fit an under guard to stop dirt and gravel entering the chassis. If you intend to race your Fire Dragon Buggy model at a competitive level, I would also recommend you obtain and fit titanium pivot shafts, turnbuckles, tie rods and steering rods. The Fire Dragon steering servo is also prone to damage. In high speed crash situations, the fragile gear teeth of the servo can be broken off, rendering your expensive servo useless, so be sure to obtain a good quality "Servo Saver". Check out my Servo Information article. If body roll on your Tamiya Fire Dragon is a problem, handling can be improved with the use of stabilizers, anti roll or sway bars, stiffer tuning springs and, or, thicker silicone oil in the dampers. Finally, good luck with your Fire Dragon model and good racing.